As you sit down to watch a movie in front of your big screen with a warm buttery bowl of popcorn, have you ever wondered, "Why does popcorn pop?" Since even young children can make popcorn we all assume that the process of corn popping is probably a simple one. When in actuality the popping process is a fairly complex one in which many factors must be just "right" for the popcorn to pop at all. There are three elements in popcorn that allow it to pop. Each kernel contains a small amount of water. This is a key factor in facilitating the popping process. The percentage of moisture must be around 13-14% in order for the kernel to pop. When popcorn is harvested the amount of moisture is usually between 16% and 19%. The kernels are either cured or dried until the ideal content is reached. If the moisture content is too low there will not be enough steam to cause the kernel to pop. If there is too much moisture the kernel will explode prematurely before the starch inside is properly cooked to form the fluffy popcorn. The majority of the kernel is comprised of a carbohydrate, primarily in the form of a starch. This material expands approximately 40 to 50 times its volume when the kernel pops. This is called the Pericarp, or more commonly, the hull. This is very strong and air tight. It must be strong enough and contain no leaks so that it will not rupture until the ideal temperature and pressure in the kernel has been reached. If these conditions are not met the kernel will not pop. These three factors are why popcorn pops. As the kernel is heated numerous reactions take place. Once the temperature of the water in the kernel passes the boiling point (212 degree F) it turns into a superheated pressurized steam. As a result the starch softens and becomes more pliable. As the temperature continues to rise the pressure increases as well. At a temperature of approximately 350 degrees F, and a pressure of about 135 psi, the hull will fail and the kernel will explode. The expanding water and steam drive the starch out forming jelly-like bubbles which quickly dry and solidify into the familiar crispy puff. 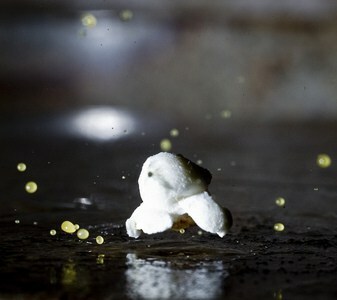 You can view a video of popcorn popping in slow motion. Now if someone asks you, "Why does popcorn pop? ", you can give them the scoop!